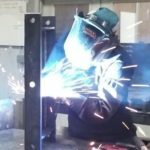 She welds like a girl (and that is a good thing)! Elizabeth Popejoy-Geiken started with HEM in March of 2018 after graduating from the Marshalltown Community College welding program. 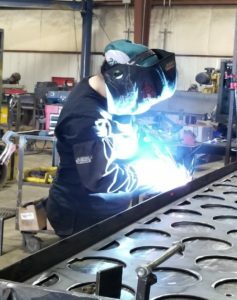 She discovered her love for welding and started developing her skill in high school, taking a MIG welding class. She found that she was pretty good and made the career decision. Liz enjoys building control boxes as they are small. She welds downhill beads on the corners and grinds them to a smooth finish. She is very proud of their look when finished. She is most challenged when welding extra heavy assemblies. The use of a forklift to move and hold large pieces in place is new to her and working on these larger frames can be frustrating. 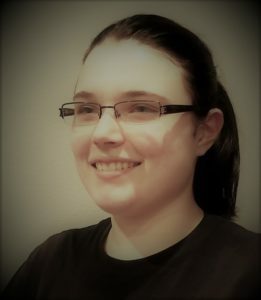 Liz enjoys drawing, playing video games, watching cartoon and talking walks. She describes herself as an unusual person who likes rainy days and night time. As a creative person, she works best with her hands. Her personal philosophy is that one must work for what they want, be it a decent living or something special like a nice vacation. Life has obstacles and that is why faith, family and friends are essential to her. Liz believes one needs to balance work and play with too much of one being depressing. She recommends to always try and have a good sense of humor.